The Colors Of Indian Cooking: Bye Bye Blues..A Quick and Spicy Bean Dish! Bye Bye Blues..A Quick and Spicy Bean Dish! I have a small confession to make. I love trick vegetables. You know what I'm talking about, the orange cauliflower, the red squash, the black garlic. 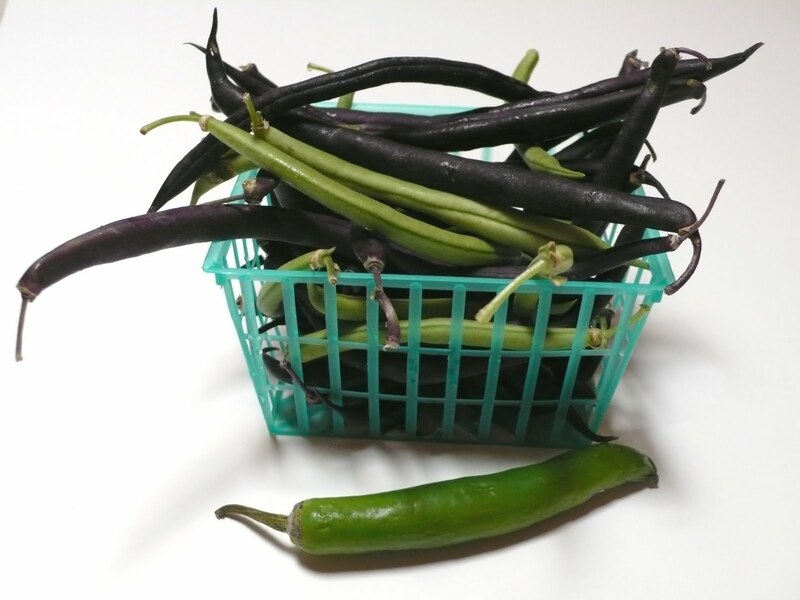 So you can imagine my surprise and delight when the gang at Lunita Farm showed me a basket of dark purple green beans at the Saturday Farmers Market. I'd never seen anything like them before and of course I had to have them. I whipped out my change purse, and impulse buyer that I am, plunked down my two bucks on the barrel head. They looked so pretty that at first all I wanted to do was stare at them. Pretty purple beans! But I knew I had to cook them, and quickly, because beans are best fresh and after a day or so in the fridge you're playing dice with the bean universe. It seemed no matter how hard I thought, I couldn't come up with a bean recipe worthy of these little gems. So I didn't use a green bean recipe. I had a Fava bean recipe from Michelin-starred Indian chef Atul Kochhar, author of the cookbook Indian Essence. I thought if this would work with Fava Beans why not with these quirky little not-green beans. I decided to give it a try. This is my adaptation. Start out with 1 lb of green or mixed green and not-green beans. Cut them up into 1 inch pieces. The not-green beans have a heart of what else?...green! Set them aside. Stir it all around. In about 5 minutes or so the chilies will have gotten soft. 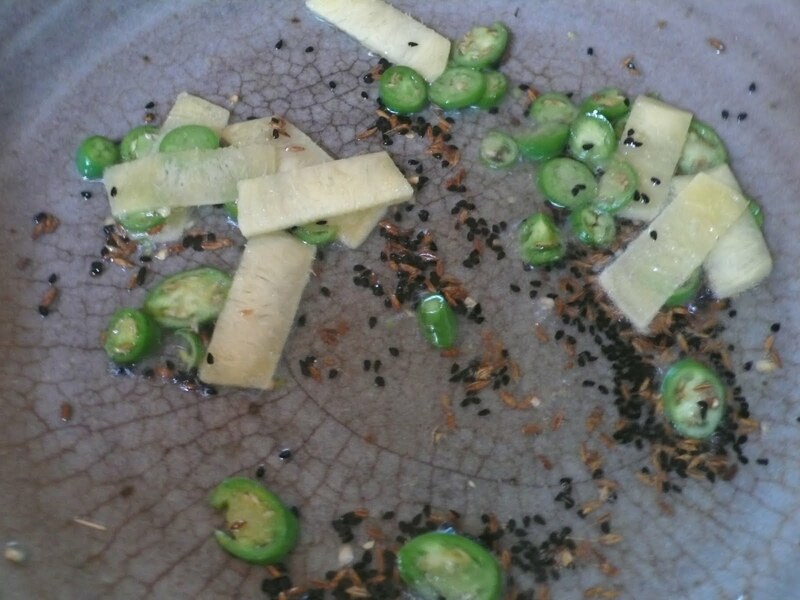 Put in the sliced green and not-green beans. Give it a final stir and scatter some julienned strips of raw ginger over the top. You're good to go. These beans were amazing, sweet, pleasantly hot with a kick of ginger and ready to go in about 30 minutes. I probably could have even had them on the plate faster had I not been totally mesmerized by their beany beauty. The only warning about these little beans, they don't keep their color. When cooked they become just ordinary green beans again, so if you want to show them off in their natural state either take a picture for your guests, or invite them over a few minutes earlier to help you cook! I love veggies like this, I would have grabbed those in a second too! They look tasty too! Love that you call them "trick" vegetables. I too am enticed by them. Your bean dish looks divine! Lovely and healthy recipe Kathy! Good clicks. Great way to spice it up! Purple beans? I never cooked stir beans before but I will try for sure this recipe! Hi Kathy....I love this dish sounds awesome and congrats on foodgawker saw the banana split there fabulous! Oh! purple beans... pity they don't keep the colour after they are cooked. Those beans look gorgeous! Just curious to know if they taste any different from 'regular' green beans...? I'm a sucker for those trick vegetables too... even if it was slightly disappointing to discover that the purple beans turn green when cooked (I got over it pretty quick, though). We've had a bumper crop of green beans this year, so I've been on the lookout for yummy new recipes I can make with them... and this one looks like a keeper. Thanks for sharing! What a bummer that they don't keep the color. They're so gorgeous. Your dish looks delicious too. It's nice to find kicked-up beans out there. It's so surprising to see purple beans. Never seen it before. And your dish sounds scrumptious with cumin seed and nigella seed. I must try these spices with green beans as I can just find the green ones here. I discovered the purple green beans last summer and was also mesmerized by them. You seem to have taken the color change better than I did. When my pretty purple beans turned green, I was so disappointed!